The Himalayas are a formidable mountain range, often forming an imposing, impenetrable barrier for hundreds of miles...meaning, there is no way to cross. The villages (or countries!) on one side are completely isolated from the villages on the other side. No trade. No social exchange. In 1950, for example, Maurice Herzog, famed French mountaineer, attempted to find a route to Annapurna I by way of Tilicho Lake. He encountered a "Grande Barriere" of precipitous rock wall extending from Khangsar Kang peak to Nilgiri peak, with "no line of weakness on which the trained eye of a mountaineer might hope to trace out a possible route". 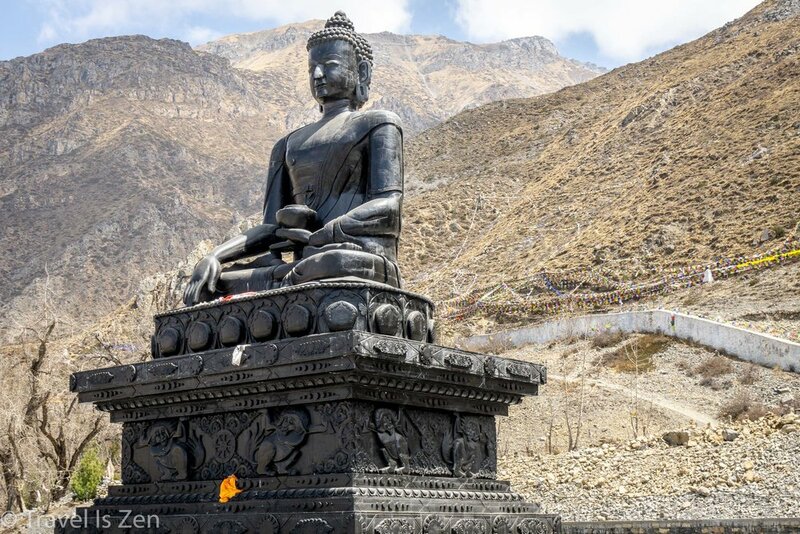 Mountain passes through the Himalayas, then, have played an important trade, military, and migration role throughout history, linking villages within the 1500 mile Himalayan expanse through Pakistan, Afghanistan, India, Tibet (China), Nepal, and Bhutan. 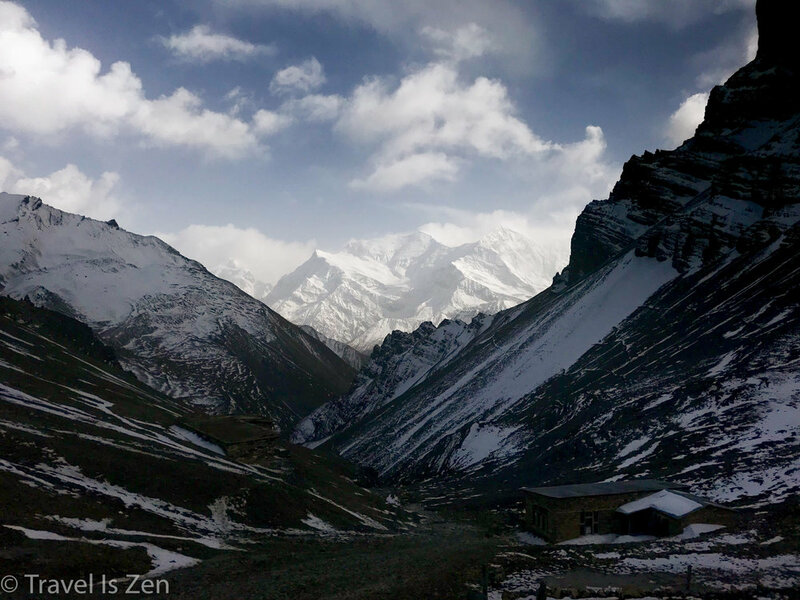 Thorong-La Pass is the highest mountain pass in the Himalayas... and the highest in the world! It sits in a ridge saddle at 5216 meters. That's almost 18,000 feet -- more than 3 miles above sea level! The pass connects the two large trading towns of Manang on the eastern side and Muktinath on the western side. For many trekkers, Thorong-La Pass is the climax of the Annapurna Circuit excursion. Indeed, many hikers descend from the summit and then hail a jeep in Muktinath to catch a plane in Jomsom. For us, crossing Thorong-La was the mid-point of our trek, as we intended to hike for another 10 days or so on the Western side of the pass. That did not diminish our excitement, though. As we lay shivering in our sleeping bags at High Camp, excitement robbed us of sleep as much as the cold. Wide awake at 1:00 in the morning, I went outside for some fresh air. The full moon illuminated the snow-capped mountain peaks and the entire camp was cast in a cold pale-blue light. The air was absolutely still. No wind. No sound. It was beautiful! We were packed and ready to roll at 4:30 a.m. As we walked to the dining hall for a light breakfast, we could see headlamps bobbing in the darkness down the mountain. The hikers from Thurong Phedi camp had started a couple of hours earlier. High Camp, pre-dawn, looking east towards the Chulu mountains; Thurong-Phedi is in the valley below. The first of the Thurong Phedi crew had reached High Camp by the time we finished breakfast about 5:00 a.m., just as the sky was turning pink. Immediately past High Camp, a queue was forming. The path was single-track, covered in a foot of snow and ice, with a perilous plunge on the right side. The line of hikers was slow-moving. A donkey carrying a load slipped, whinnied, but found its footing. The woman directly in front of us lost her nerve and stalled on the path, shaking. The line waited for her to regain her composure and then we all shuffled forward towards the suspension bridge. That first section was probably less than half a mile, but for the sleep-deprived and oxygen-starved, it seemed treacherous. Crossing the suspension bridge, we headed up the snowy pass. The trail improved, but the altitude made every step a heart-pounding exertion. And it was cold. Bitterly cold. The pass has a series of inclines that level off intermittently before ascending again. Enterprising Nepalese men were perched on each ridge with a couple of saddled donkeys, enticing the exhausted to fork over a couple thousand rupees for a ride to the top. Oh, it was tempting! It took us two and half hours to reach the summit. 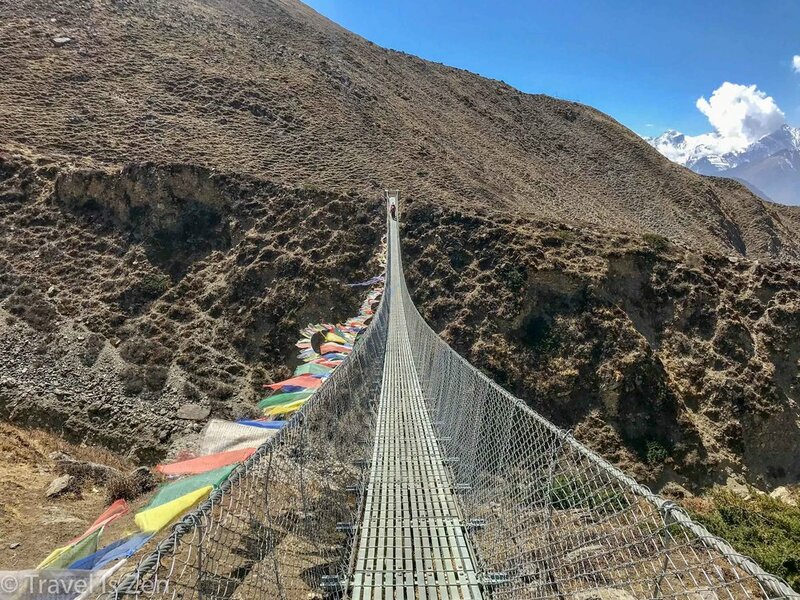 We tied the prayer flag that we purchased in Upper Pisang to others on the mani wall, snapped some pics, ate frozen snickers bars and chatted with a few familiar trail faces. Fixated on the summit, the mood is celebratory at the top. High fives, smiles, hugs. But then it's time to descend. And nothing has prepared you for the buzz-killing, endless six mile scree-covered slick slope to Muktinath. The hike down took four hours. Much of the trail was on narrow, north-facing slopes, covered in re-frozen snow and ice. It was technically challenging, mentally taxing, slow-going and painful on the knees. We relied heavily on our trekking poles to keep from sliding; this is where a pair of crampons would have been a god-send. We rolled into Muktinath around 1:30 in the afternoon, completely depleted. I had nothing left in the energy tank. We checked into the first inn we encountered. I took a scalding hot shower (my first in five days! ), drank a beer on the inn rooftop while my hair air-dried in the sun, and then climbed into bed, sleeping warmly and soundly from 3:30 p.m. until 5:30 a.m. the following day. Complete exhaustion. 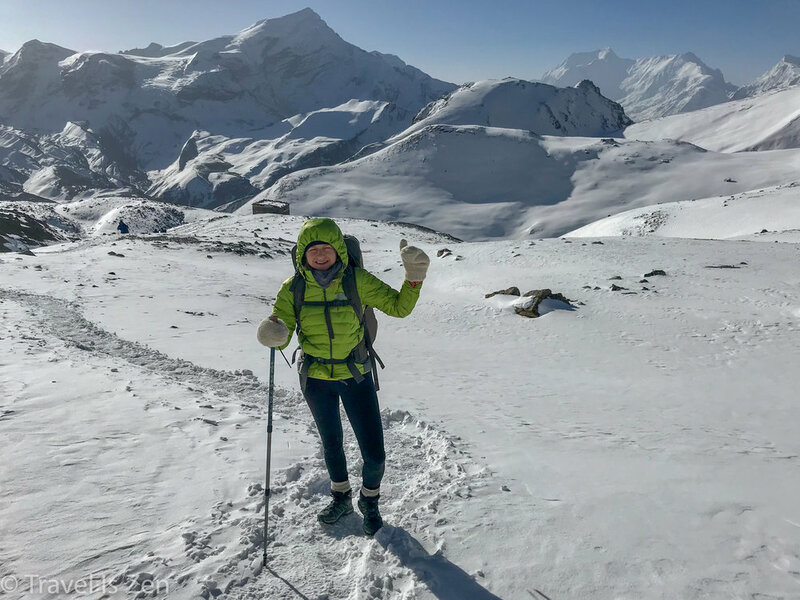 I have hiked steeper mountains than the Pass; I have hiked further than the 8.5 mile trail between High Camp and Muktinath. But never at that altitude. It's just a whole new experience. Glorious relaxation today. 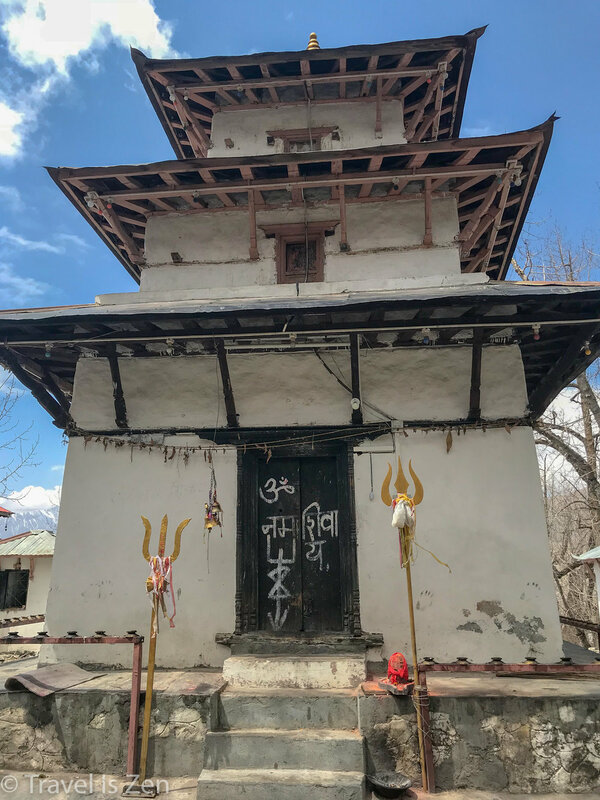 We spent most of the day sipping beverages, eating and watching the Hindu and Buddhist pilgrims from India parade through town on foot and donkeys to Muktinath's venerated sacred temple. We finally decided to see what all the hubbub was about and strolled (very slowly) to check out the temple. Until traveling to India and Nepal, I found Hindu and Buddhist temples mystifying and confusing. A Buddhist temple often contains imagery of boddhisattvas and reincarnations of Buddha with multiple heads and arms, appearing similar to Hindu gods and demons. Hindu temples often contain shrines to Buddha. I have learned that Hindus accept Buddha, who was born into a Hindu family, as the 9th reincarnation of Vishnu, the Preserver. 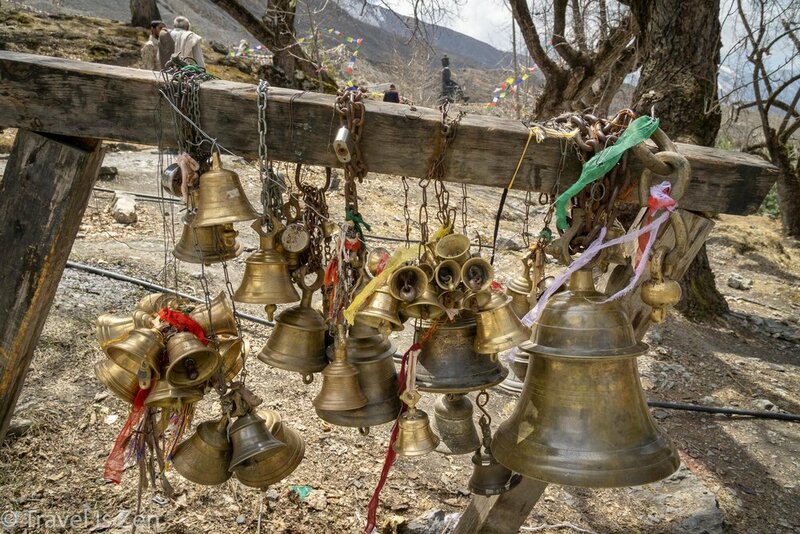 This is why it is common for Hindus and Buddhists to worship harmoniously together. Wouldn't it be nice if Jews, Muslims, and Christians -- who share a common monotheistic belief system and even some traditions, patriarchs, and prophets -- could peacefully respect and honor each other's religions... even feel welcome in each other's temples, churches, and mosques?